Known for its deep canyons and large white sand beaches, it also boasts a vast variety of landscapes visible from the river and a few hotsprings. Imagine monumental bluffs and slides, picturesque castles and towers, solitary crags and wooded forests rising to the sky. Labeled as the 2nd deepest river canyon in North America, you won’t find the milky way and shooting stars elsewhere shining brighter. Wilderness to the north, and The Gospel Hump Wilderness to the south. You will be floating through a primitive, protected, section of wild lands totaling 4.3 million acres, nearly half the size of the total protected wilderness areas in the nation, at 9 million acres. Gliding down this river, camping on the beaches, and sitting on the canyon rims will offer you no better chance to witness wildlife and a river running free. The hard work, experience and gourmet recipes of your “outfitter and guides” will impress you with the comforts of the twenty-first century. Thanks to the efforts of Senate Floor Sponsor Frank Church in propelling the passage of the nation’s Wilderness Act in 1964, and becoming the lead in designating the State of Idaho’s most primitive landscapes as wilderness areas, in 1984, Idaho honored Frank Church by adding his name to the river and wilderness. Some folks call the river “The Frank.” Names, like this river, keep flowing and have not rested yet. One more name is starting to take hold. You will hear it most from outfitters, river guides, landowners and guests that frequent this area. 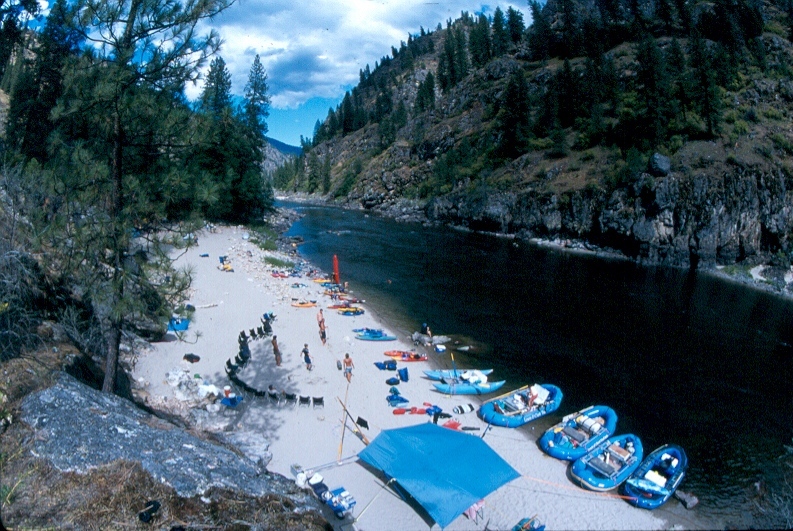 They call the river and the wilderness “The Heart of Idaho.” We have to agree! Step into beautiful landscapes, hear about the history, enjoy fun adventure, as you peer into a different world - of not so long ago.